We take pride in our Customer Service. You can rest assured that we will do whatever it takes to accommodate you. If you are not 100% satisfied with the product, for any reason, give us a call within 3 days and let us know what we need to do. We will do whatever it takes to make you happy. Please remember sizing your new belt is critical. Belts that are measured incorrectly are not returnable. Active Law Enforcement personnel, Active Firemen, as well as Active Duty Military, can take advantage of a 10% Discount (please call us to take advantage of this Discount). This is our way of saying “Thanks For Your Service”. Normal delivery on “Custom Orders” is 3 to 4 weeks. If you need it faster, give us a call and we will do everything we can to accommodate you. 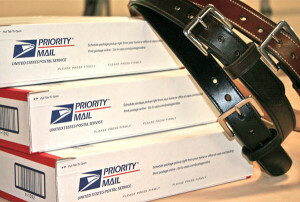 We ship Priority Mail at a flat rate of $8.95 unless otherwise specified.